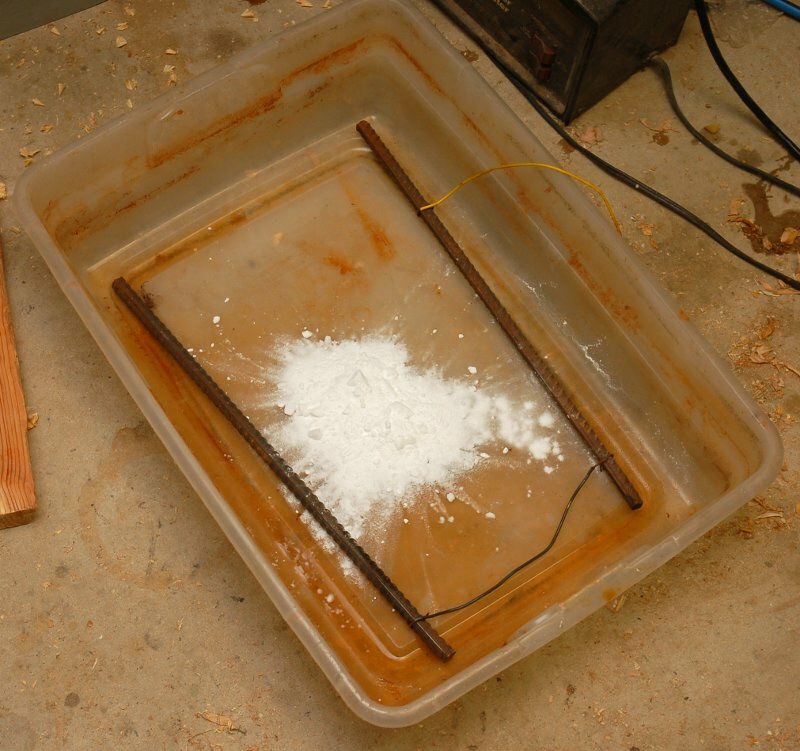 I’ve been saying for a long time that I’d do a post on rust removal using electrolysis. I’ve finally gotten around to doing it. 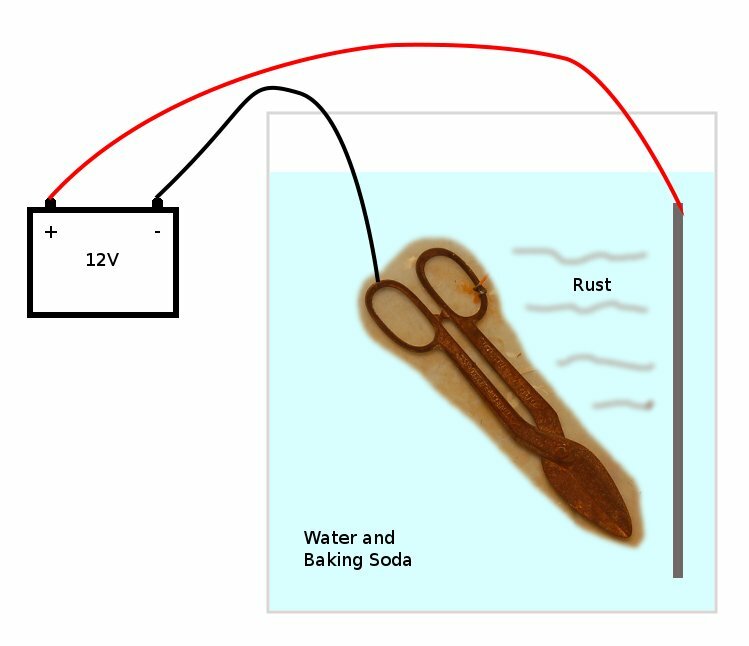 In this application Electrolysis uses electricity to remove rust from an object that is submerged in a liquid that conducts electricity. It’s as simple as it sounds and is very effective. To use it you’ll need a cheap car battery charger, some wire, a plastic tub, baking soda, scrap piece of metal, and something rusty. To provide electricity you’ll need a DC power source. The cheapest and easiest way to do this is to use a car battery charger. For a battery charger you’ll need a “dumb” one. Some of the fancier chargers today have the ability to sense shorts and automatically adjust their charging current. You don’t want these because they’re smart enough to realize they’re not being used on a battery. The “dumb” one just produces current when plugged in. Exactly what you want. Next, you’ll need a liquid that conducts electricity well. Water is readily available but doesn’t conduct electricity well on its own. Fortunately, you can add baking soda or washing soda to it which will fix this problem. A lot of the sites online recommend washing soda and say it works better than baking soda. In my experience, I’ve found that baking soda is effective and dissolves more easily than washing soda. I usually just toss a scoop or two in the water and mix it. I’m sure there’s a perfect ratio but it works fine if you wing it. You’ll also need some metal. One piece of metal you’ll need is a scrap piece of steel or iron. This piece is called the anode and will attract rust. The other piece of metal you’ll need is the thing you want to have the rust removed from. To find this piece, I took a trip to the flea market and found some snips for about $5 total. The ones in the top picture below were made by Compton Service and the ones in the bottom picture were made by Craftsman. To get everything started, find a suitable plastic tub and fill it with enough water to submerge your rusty item. Mix baking soda or washing soda in the water until it has dissolved. Next, put the sacrificial anode in. Take your rusty object and remove the rust in a small spot. Then wrap a wire around the bare spot and connect the other end to the negative (black) clamp from the charger. Attach the positive (red) clamp to the anode. If needed, use a wire on the anode so your clamp isn’t in the water. Now plug the charger in. You should now see bubbles coming from the surface of your rusty object. Congrats it is working. Check out my fancy graphic below to illustrate the above instructions. A couple details. Do not reverse the polarity. If you do, you’ll rust your object more than it already is. The bubbles are hydrogen. Some folks say to only do electrolysis outside to keep from blowing yourself up. I always run it in my garage without issue. If you hold a flame up to the surface of the water where the bubbles are you’ll get a nice pop pop pop….not that I’ve done it of course. The best anode is a graphite rod because it never gets consumed in the process but I don’t have one. If, after you turn it on, you only see bubbles on the wires, you don’t have a good connection. Wiggle the wires or make a better connection until the bubbles appear on the metal pieces. The process works fine on chromed items such as tools that have rusty spots. If the chrome is loose in spots it will come off. Even the spots around the flaking chrome will be affected because it may have already loosed at a molecular level. If you have an object that has a black oxide coating this will remove it as easily as it does rust. If you’d like a much more in depth description of the process and the science behind rust removal with electrolysis check out these two sites: Link1 and Link2. 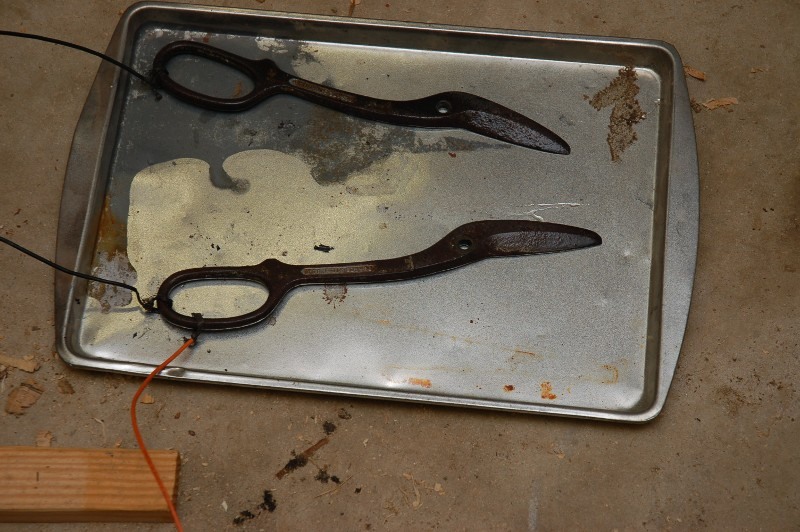 Lets see how electrolysis works on a couple pairs of snips. Below is my fancy tub, anodes, and a couple scoops of baking soda. I use cheap pieces of rebar for my anodes. Here are the snips in the tub all wired up with water. Later I added a jumper wire between the two halves of the snips so that both sides would get affected equally. The amount of time to let it run depends on how rusty the object is and how much current you have. From my experience, there is no problem by letting it run too long. Once it is finished the areas covered with rust will now be covered by a black sludge as shown below. 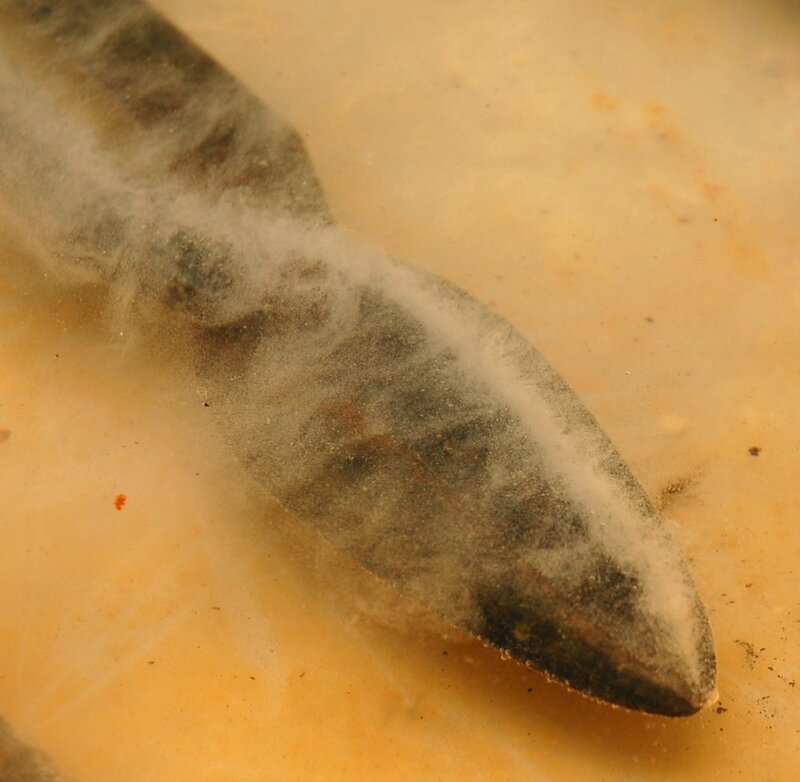 Depending on how rusty the object was, the surface of the water may be covered by a rusty foam. The water may also turn dark brown with rust. For these snips though, there was only a light tan color with rust flakes on the bottom of the tub. The dirty water can be used over and over again. Of course the black sludge has to be removed as well. I decided to try media blasting it to remove the sludge. The partial and final results are shown below. I realize I could have just media blasted the rusty object without using electrolysis on it but decided to try it anyways. This method results in a matte grey lightly textured surface. The way I usually clean the black sludge off is to scrub it with a green Brillo pad and wash it with water. With this method you’re left with a smooth surface that still has black spots in it. This is more work but I prefer the results. The tools maintain an aged look. Once the surface has had the black sludge removed they will immediately start rusting. So, be sure to use oil, wax, or use something else to protect the surface. 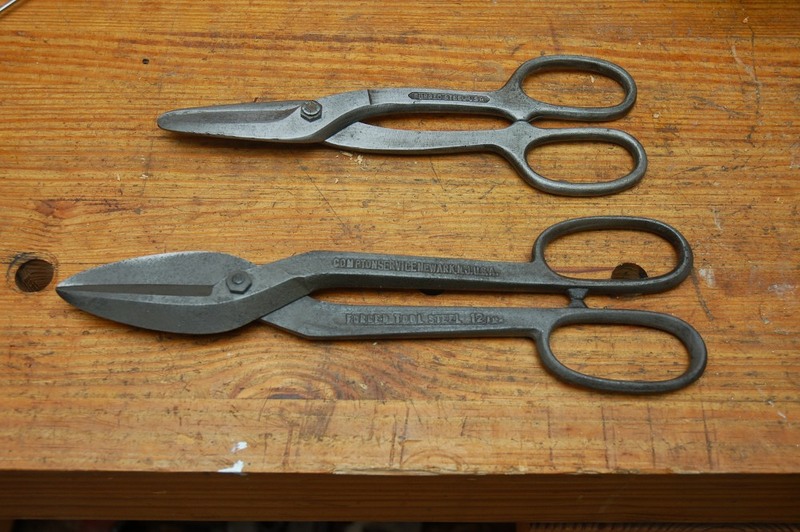 Before I put the snips back together I sharpened them. 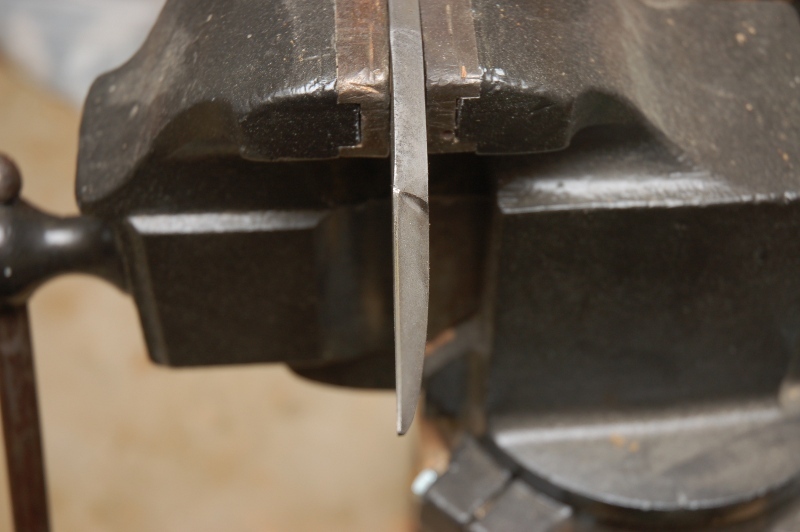 To do this I put them in the Prentiss Vise and ran a file across the cutting edges. Now both sets can be put back together and are ready for use. Not bad for $5, a couple of amps, and some elbow grease. 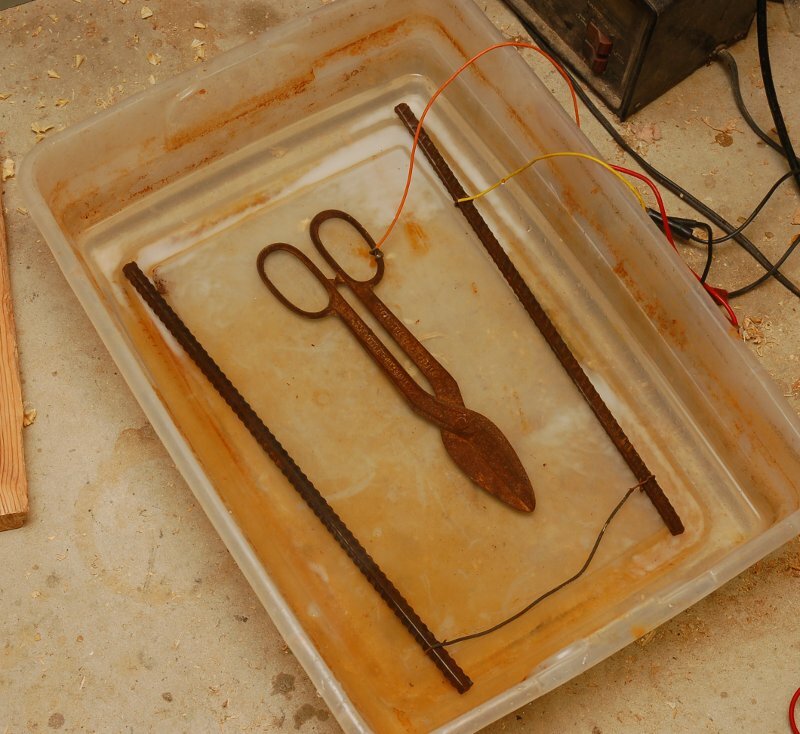 This entry was posted in At home science, Restoration, Tools and tagged electrolysis, rust. Bookmark the permalink. Very interesting article. I’m going to try this my self in the near future. Currently I’m rebuilding a battery charger so that will become my power supply. One question for you, Once you turned on the power how long did it take to remove the rust, (minute, hours, days)? It depends on the amount of rust. It usually takes several hours to remove a moderate amount of rust but I’ve left it running overnight on heavily rusted things. It’ll also vary depending on how strong the solution is. Up to a point, more washing or baking soda will conduct more current making it work better. Hola, muy bueno el articulo, sugerencia, barras de carbón se pueden obtener de pilas electroliticas viejas. Can I use a 12 volt battery charger instead of a dumb car battery? Read again the instructions. He USES a charger!!!! I have tried the electrolysis method and the vinegar soak rust removal method. I have not experimented enough to say which method is best but both methods produce the same excellent results in the same amount time. QUESTION? Has anyone ever tried a combination of vinegar, soda and electrolysis? The chemicals used are not particularly critical to the process. They are used to make water (an insulator) CONDUCTIVE by dissolving easily ionized chemistry into the water. Soda and vinegar are mutually antagonistic . . . they bubble when mixed but the stuff left over is still conductive. Not sure it would have a great effect on the rust removal process. The rust removal WORK is being accomplished by the flow of electrons from the power source into the work piece. This can be MEASURED with an ammeter. The value is a function of the rigs RESISTANCE and the voltage applied. Resistance is controlled by conductivity of the solution (proportion of soda added) and surface area of the electrodes. I would recommend the largest practical, non rusting material for the (+) electrode . . . how about a stainless steel bowl? In fact, the cleaning bath could be contained in a large stainless bowl or baking pan which is ALSO the (+) electrode. Then support the item to be de-rusted on a plastic dish so it doesn’t short to the container. So, yes vinegar contains an acid (1.5-3% acetic acid) and baking soda is mostly a base. However, since there’s no precipitate formed, and the acetate and bicarbonate aren’t volatile, those two ionic species are still there and will conduct. Little bit of a waste of resources though. The combination is really only good for volcano models. and the fenders off this old bike l have ?? A speed of light by sand blasting them. Also instead of a battery charger could you get away with cutting the felmale end off a exectend cord bare the wire’s place one on rusty part and the other on your clean iron. Use water and baking soda. Just keep your body parts out of the water till you un plug it.. Thank you !! Have a great cleaning day !!! You can derust as large a piece as you can submerge. Somewhere online is a page about a guy who cleaned a car frame using electrolysis. No. You can’t clip the end off of an extension cord. You need DC electricity. Ok, i realize this was asked a while ago but figured id give my input anyway. Yes, it works on anything any size with the right setup. Also, with something that big you may want to either agitate the work, or create a very slow movement in the water to keep the electrolyte in contact with your metal “fresh”. As the person said before, don’t use an extension cord. You need DC, where your positive is attached the the anode (any conductive metal will do), and the negative to the cathode (rusted piece). Heres what i wanted to add, this process can also be used to etch designs, makers marks or whatever you want into most conductive metals. Example, i use this method to etch designs into knives using electrical tape with a design carved into it. Also, if you reverse the feeds, you can use this process to electroplate with nickel, copper, gold etc. Ive had pretty decent results plating knives with nickel (kinda a chromed look) using salt water in a 2l coke bottle. Earlier, someone asked about vinegar as the solution, dont, it produces a gas thats pretty irritating to the eyes. In fact, if you plan to use anything other than salt water, baking soda or just want to experiment, to a ton of research first. This is a chemical process and can produce some pretty nasty gases. If you find that your electrolyte isnt working, you probably just need to refresh it. The most important thing is a large amount of amps (be careful of course), I prefer a 12v/6a charger. A car battery would probably work very quick, but it would want to draw a ton of amps so could be dangerous. se puede hacer con 220v ? I’ve tried vinegar, naval jelly, Vaporust plus a few more concoctions and electrolysis works best for me. If you do a lot of rust removal I would suggest you use a certain type carbon/graphite anode instead of scrap metal. The process is a lot cleaner with carbon graphite. It is for sale on eBay but I would suggest you contact the seller and let him know what you will be using it for because it takes a certain type. Could you use this method on very rusty cast iron skillets? Yes. I’ve done so without issue. Just be sure to wash them well afterwards to get the iron residue off. If you’re going to use media blasting, why wouldn’t you just use that method for the whole procedure? Electrolysis is basically the reverse of the electro-chemical process of rusting, so restoring some of the base metal and arresting the rust. Downside is that rust is an expansion process so a rusted item will be larger assuming none of the material flaked off. I’m not understanding why, if you have a media blaster, that you just don’t use it? Its all I use when I’m prepping something to paint, it removed rust and cleans at the same time. My media blasting setup is a cheap gun from HF. If I had a nicer setup I’d definitely blast more stuff.